On the northwestern corner of South America, Ecuador is uniquely positioned to engage with the outer world, including the economically dynamic East Asia across the Pacific Ocean. The equatorial country -- hence the name “Ecuador” -- offers the rule of law, political stability, a dollar-based growing economy, and an abundance of natural resources, Ecuadorian Minister of International Trade, Pablo Campana Saenz said in an interview with local media on Dec. 5. “Our government under President Lenin Moreno is leading our country based on pragmatism, and considers Korea one of our strategic economic partners,” he said at the Ecuadorian Embassy in Seoul. During his visit here, Campana met with governmental, political and financial leaders, as well as corporate executives in hydroelectricity, hydro resources, mineral resources, construction, airports and other sectors. He encouraged investments by presenting portfolios worth over $20 billion unveiled by the government. He proposed finishing negotiations on the Strategic Economic Cooperation Agreement before the Group of 20 Summit in Argentina in July next year, to which Korean President Moon Jae-in has been invited. In particular, Campana elicited Korean companies to participate in the planned construction of Pacifico Eloy Alfaro Refinery and Petrochemical Complex near Manta on the Pacific Coast through a consortium. The scheme will be the region’s largest petroleum refinery, producing over 300,000 barrels of refined oil daily. Opportunities for bilateral economic cooperation also lie in processed food, petrochemicals, energy and mining, according to the businessman-turned-bureaucrat. Campana was a professional tennis player prior to launching a career in business. He was a national player partnering Nicolas Lapentti in the 1996 Atlanta Olympics, as well as playing in the Davis Cup. He achieved business success in sugarcane, soft drinks, real estate and other sectors prior to joining the government in May. Although Ecuador is not sizeable, it has a diverse climate with four topographical regions -- the Pacific coast; Andean and Inter-Andean highlands called the Sierra; Amazon jungles; and the Galapagos Islands, he noted. “You can move from one region to another in one hour by plane, with each region providing strong climatic characteristics and great biodiversity -- perfect for leisure and ecotourism,” he said. Ecuador also offers up-to-date transport infrastructure, a business-friendly environment, the same legal protection to outside investors as national investors, and tax incentives for foreign direct investment, the minister said. 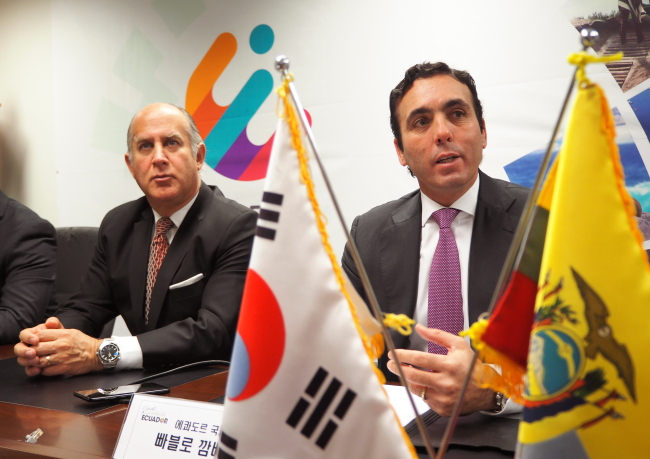 Several Korean companies, including Dongwon Enterprise, Samsung Electronics, LG Electronics, Hyundai Motors and SK Construction, have invested in the Ecuadorian economy, which is largely based on petroleum, agriculture, aquaculture, timber, tourism and bio industries. Ecuador is a major exporter of shrimps, bananas, flowers and cocoa as well as the region’s leading producer of coffee, rice, potatoes, cassava, plantains and sugarcane. The country’s livestock sector produces cattle, sheep, pigs, beef, pork and dairy products. The Ecuadorian government announced a $7 billion program for the country’s energy transformation in August, 2015, with an aim to source over 90 percent of electricity from hydropower. The country is also stepping up investments in wind power and solar energy.